Saigon Central Post Office is the post office building at the centre of Ho Chi Minh City, District 1. It's no doubt the biggest post office in Vietnam and is an important commercial center of Ho Chi Minh City. This grand old edifice was constructed between at the end of 19th century by the famous architect Gustave Eiffel in harmony with the surrounding area. Its architectural design represents the French colonial style. The main entrance of the Central Post Office is decorated with intricate ironwork, creating a strange architectural style drawing curiosity of visitors. Entering inside, tourists in Vietnam travel can have a look at the huge maps of Vietnam on both sides of the building’s main entrance. 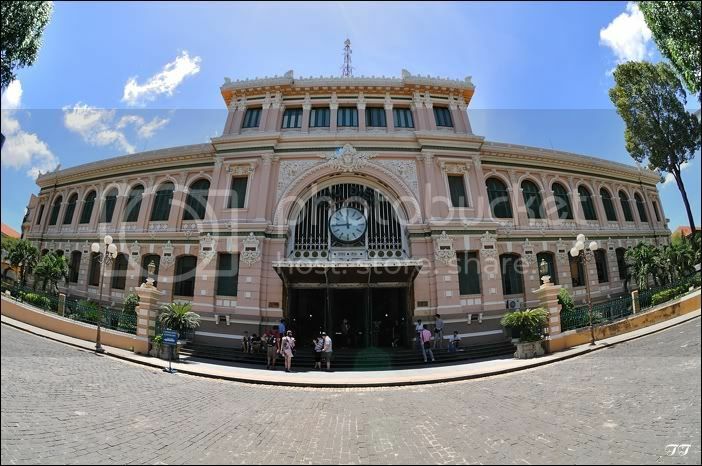 The elegant interior is considered to be the most interesting feature of the Central Post Office in Ho Chi Minh City. The vaulted and shining interior with its glass canopy, huge ceilings and a giant portrait of Ho Chi Minh, has enough to charm you. The counters are laid out lengthwise on both sides and the telephone booths are old style. Currently, the post office has many booths serving for the guests with modern and up-to-date telecommunication equipments through which you can make contact with everywhere inside or outside the country. Besides, there are other good services like mailers on which time has been recorded, sending packages quickly, souvenirs, electronic flowers, electronic presents, etc. However, thousands of people also come to here every day to take in history and culture rather than send letters. There are benches for visitors to rest.Tourists in Vietnam tourism can also buy old stamps, post cards, and other objects to take home as souvenirs. For them, a photo here is mandatory. The women in the sales counters wear the traditional Vietnamese ao dai and speak fluent English to the delight of foreign visitors in Vietnam travel.